Perennials as a group are bursting with new varieties. Large varieties are getting smaller - or larger! Take a look at Salvia nemorosa, "Marcus". 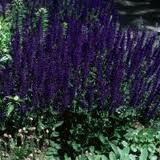 "Marcus" is a dwarf clump-forming perennial salvia with deep violet flowers that typically grows to only 8-10" tall. Perfect for borders, containers, and windowboxes! stunning in any garden, huge white flowers, on strong stems, very long bloom season, and can take full sun. Now we have pink blueberries! (Can we call them pinkberries?) 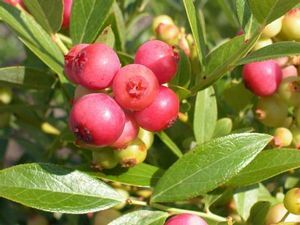 Pink Lemonade Blueberry has the same flavor and heavy fruiting traits as traditional highbush blueberries, except the fruit is pink! Espoma Lawn Food are both organic, slow release fertilizers that may be used throughout the seasons. Espoma is a phosphate free fertilizer. (More about this in FYI section). Jonathan Green and Espoma are also offering organic weed control. Both are corn gluten based and provide pre-emergent weed control. TIP: Do not apply pre emergent weed controls near young plants, or seeds. Please: follow the directions on any fertilizer, weed control, or pesticide. Even organic products are harmful if misused. A number of communities are enacting phosphorous-free fertilizer regulations. Community leaders feel that homeowners are a major source of pollution of water systems. Too much phosphorous in the water results in an over-abundance of algea growth which lowers the oxygen levels, introduces poisonous toxins and has resulted in fish kills and loss of habitat. Q. What do I use to turn my Hydrangeas back to blue? A. 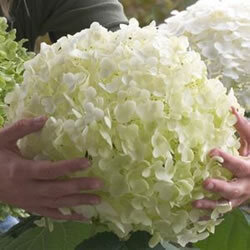 To turn hydrangeas back to blue you need to lower the pH of the soil. Two popular products which will accomplish this are Aluminum Sulphate or Espoma Garden Acidifier. Espoma is an organic, slow release product which is safe around children and pets. To apply, sprinkle a handful around the base of each plant and scratch into the soil. Apply in 60 day intervals.